Don’t ruin your house! Relocate furniture, appliances and other items without causing damage to your home or office. Hand trucks beat up stairs leaving scratches, scuffs and dents. Dollies can scrape up floors and they tend to get stuck in thresholds. 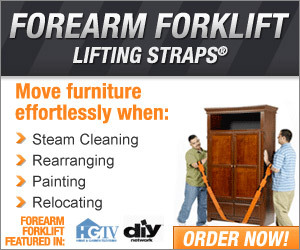 Forearm Forklift Lifting Straps rise up over doorsills leaving your home undisturbed.